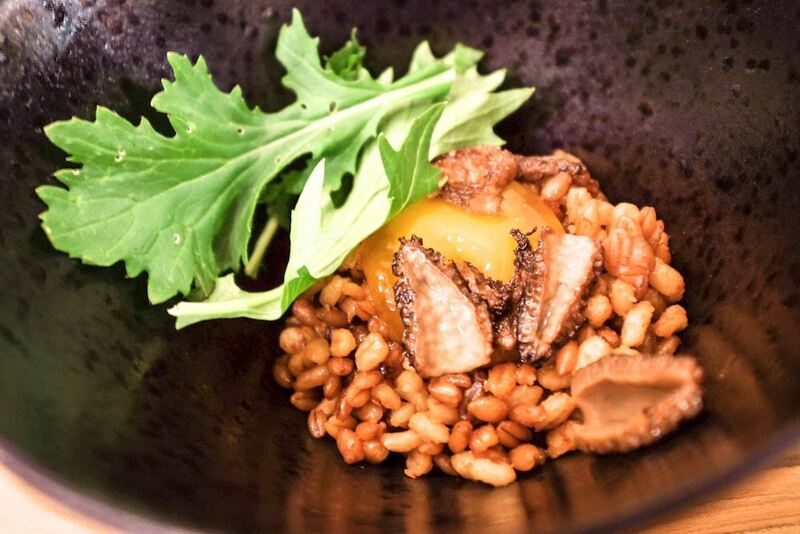 The idea for this dish is 100% stolen from ("inspired by") a dish served at Single Thread Restaurant - after the main beef course, several different types of barley and grains are served together with an intensely fragrant beef broth, matsutake mushrooms, and a bit more beef. After encountering an awesome dried seaweed selection at the market my original idea was to do a variation called "Grains & Seaweeds", pairing barley and amaranth with a broth infused with lots of different kinds of seaweeds and some soy, and garnished with more seaweeds. The flavor of my early trials was kind of gross, and the amaranth didn't work texturally at all. For the final variation I kept it simple and went with ingredients that are more crowd-pleasers - pearled and hulless barley are the backdrop for seasonal morel mushrooms cooked in butter, and the whole thing is topped with an raw egg yolk that's been cured in soy. Curing in this manner firms up the yolk ever so slightly and of course gives it a nice salty soy flavor. I didn't serve a broth for the final version but given infinite time I would probably experiment with adding just a bit of a deeply-flavored mushroom stock. This dish uses almost the exact same pressure-caramelization technique as the Carrot Cornets, using baking soda in a high-pressure environment to develop a rich flavor in a short amount of time. To help the flavor and umami along, the grains are caramelized with saikyo miso, aka Kyoto sweet miso (also used in the earlier sea bass dish) and some shio koji. Shio koji is a Japanese condiment that's just water combined with salt and koji rice, which is rice that's been treated with Aspergillus oryzae cultures. It's basically a mold but it's the good sort and it's how miso, soy sauce, sake, mirin, and rice vinegar are made. Shio koji is commonly used in marinades and sauces, which is basically how we're using it here. Prepare the pressure-cooked chicken stock (up to 1w in advance): Roast the chicken wings for 40m at 375F. Saute the onion, carrots, and leeks in the base of a pressure cooker for 5m, stirring occasionally. Add the chicken wings and backs, water, apple cider vinegar, garlic, parsley, thyme and black peppercorns and bring to a boil. Seal and cook on high pressure for 1.5hrs. Depressurize with cold water. Strain. Vacuum pack and freeze if not using immediately. Chill. Prepare the pearled barley (up to 24h in advance): Combine the pearled barley, chicken stock, and salt in a pressure cooker. Bring to a boil, seal and cook on high pressure for 15m. Depressurize using cold water. Strain, reserving the chicken stock. Chill until needed. Prepare the pressure-caramelized hulless barley (up to 24h in advance): Combine the hulless barley with the reserved chicken stock from above. Bring to a boil, seal and cook on high pressure for 25m. Strain, discarding the chicken stock. Transfer to a wide-mouthed mason jar. Blend the shio koji, white miso, baking soda, and the fresh chicken stock into a thick paste with a hand blender. Stir well into the jar of barley and seal finger-tight. Place the jar in a pressure cooker on ring of aluminum foil, or any other trivet to prevent direct contact with the base of the cooker. Fill the pressure cooker with water about halfway up the jar. Bring to simmer, seal and cook on high pressure for 1.5hrs. Depressurize with cold water. Remove jar and let cool. Chill until needed. Prepare the soy-cured yolks (6h in advance): Combine the shoyu and mirin in a small container. Add the egg yolks and spoon over some of the mixture. Cure in the refrigerator for 6h, basting with the mixture every few hours. To serve: Saute the morels in a small amount of oil/butter/fat for ~4m; season. Warm the pearled barley, the pressure-caramelized hulless barley, and the puffed rice together in a pan and toss to combine. Place some of the grains in the bottom of a bowl. Make a well and place a cured yolk on top. Top with the morels and mizuna.